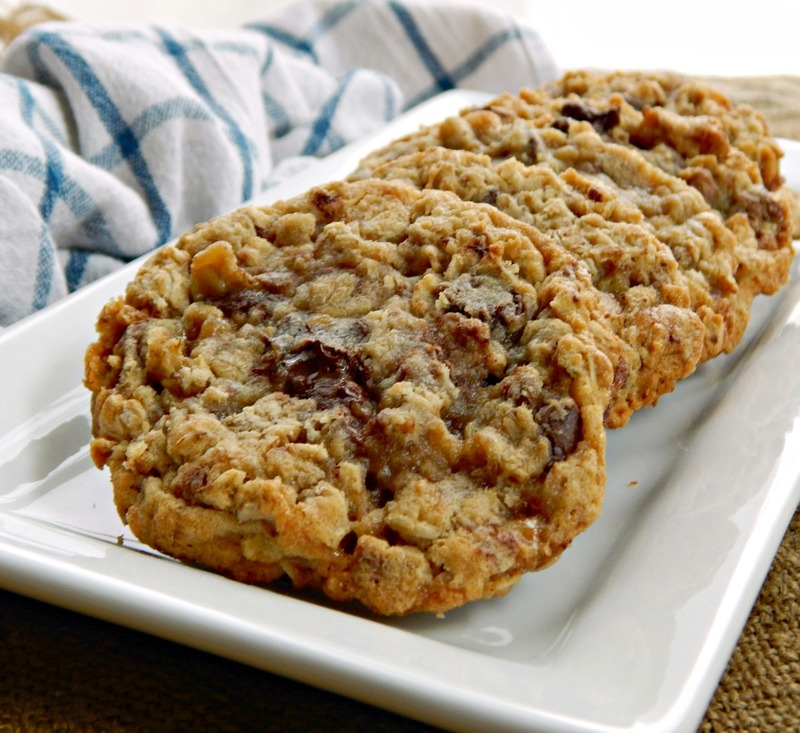 Do you want a big, delicious bakery style cookie just chock full of chocolate and toffee like these White Lace Inn Oatmeal Chocolate Toffee Cookies? I betchya do. Even if you didn’t know it before now. What a name, huh, White Lace Inn Oatmeal Chocolate Toffee Cookies? The recipe comes from the White Lace Inn in Door County, Wisconsin. Click over and see their site; it’s absolutely gorgeous. I found the recipe in that big bread & breakfast book I keep mentioning on my blog. I wish I could remember the name of it. But what the name “White Lace Inn Oatmeal Chocolate Toffee Cookies” doesn’t describe is the melty chocolate, the crunchy, buttery toffee and how the chewy cookies practically melt in your mouth. These make about 4 dozen large cookies. I kinda forgot to take an exact count using my 1/3 cup scoop because…well, you probably guessed already…because they’re so irresistible, I couldn’t help just sampling them before I baked them. Maybe more than one, lol! On second thought, I admit to nothing. You know, you’re never supposed to do that, right? I did make a few “improvements” to these cookies. A smidge less oatmeal and more toffee and more chocolate. I just had to! You’ll need to use a large bowl to make these cookies. The dough just barely fits in my stand mixer. Make sure to bake White Lace Inn Oatmeal Chocolate Toffee Cookies only until the edges start to brown, then let them sit on the cookie sheet for a few minute to firm up a bit, then slide them off. If you bake White Lace Inn Oatmeal Chocolate Toffee Cookies right away, they’ll really be at their best. After refrigeration, they can be a little harder to work with and bake up a little thicker and a little less chewy. Preheat oven to 375 degrees F. For easiest removal of cookies, use a parchment lined sheet. In a very large bowl, cream together butter, white sugar, and brown sugar. Beat in eggs and vanilla. Set aside. Mix together flour, baking powder, baking soda. Fold this into butter mixture. Add to this the oatmeal and mix, then the chocolate chips, Heath bits and nuts (if using nuts) and mix together. This completely fills my stand mixer bowl. I’ll generally work in the oatmeal then stir in the chips and Heath bits by hand. Make large cookies (I use 1/3 cup scoop and leave plenty of space, about six cookies to a tray) and bake in a preheated 375° oven for 8-10 minutes (note: it is best to under bake a little). Remove from oven when the edges have started to brown, then let the cookies sit on the hot sheet for a few minutes to firm up. Dough may be refrigerated, but cookies are really at their best if made right after mixing. Dough may be frozen. Scoop and form balls of dough, place on a parchment lined sheet and freeze. Then remove to a ziploc bag. I’m taking this recipe over to Fiesta Friday 173, put on this week by the intrepid beach comber, Angie and her two co-hosts: Lindy @ Love In The Kitchen and Paula @ Her Life Is Love. I’m sensing love in the air, this week. It just takes a second to click over and visit and see all the great link-ups. This entry was posted in Click here for Fabulous Food Posts and tagged Chocolate Chips, Cookies, Desserts, Freezes Well, Heath Bar or Bits, Oatmeal, oatmeal cookies, Toffee. Bookmark the permalink. Could you please clarify on the amount of chocolate chips needed? Not to be dense but I am not sure if you mean one and one-half 11 oz bags of chips so 16.5 oz of chips total or something else. Thanks! Sure, sorry to have not replied right away; was taking care of some family business. I use one and a half 11 oz bags. *more is more. * 🙂 I’ll take a look and clarify the recipe, too. I totally agree with less oatmeal, more toffee and chocolate. 😀 These look really good, Mollie. I think I could feed my neighbors, too. But I think they will be gone sooner before I can pack them for the neighbors. Haha! oh gosh – these look absolutely irresistible! I don’t think we get Heath toffee bits in Canada, so this recipe calls for a visit stateside. (Any excuse for a shopping expedition.) Happy Fiesta Friday! Yes, I want these cookies ..:) Thank you for sharing! Definitely need to try this. They sound so delicious! I stopped by to comment and thanks for the reblog! So funny, and thanks for the pin! That makes my day! I posted raisin oatmeal awhile back and almost didn’t post these because 1) I don’t have many cookie recipes on my blog so far, and 2) I thought two oatmeal cookies might be a bit much – now I’m glad I did! They’re both divine and you can always sub choc chips for raisins in any recipe! Have a great Memorial Day weekend! Very tempting Mollie – and a little bit naughty too! Guess what, I just ate a frozen ball of dough straight from the freezer and it was amazing. LOL … just couldn’t wait to bake it? No just curious!! I have a thing for raw cookie dough, and cookie dough ice cream is so good – so I wondered what frozen cookie dough would taste like! I know I know I’m airing some serious dirty laundry, here! It was divine!! Can’t wait to try it with chocolate chip!! And I’m wondering why I never tried it before!!! I think the older I get, the more I appreciate oatmeal cookies. It used to be chocolate chip all the way for me. Me too! A really well done oatmeal cookie is harder to pull off than a cc one, which makes them all the more delicious!